CACI International is an award winning British company with expertise in the beauty industry that spans over two decades. As suppliers to over 10,000 of the world’s leading beauty salons, health clubs, destination spas and day spas, CACI International is the largest U.K manufacturer and supplier of non-invasive aesthetic treatment systems. As the driving force behind the world acclaimed CACI non-surgical facelift system, CACI International has built a reputation as an industry leader and innovator. The CACI microcurrent facial toning system was originally developed by Dr Thomas Wing for treating a facial paralysis condition (Bell’sPalsy) but the company quickly realised the aesthetic potential of their unique technology and began promoting it as “a non-surgical facelift”. Not being ones to rest on our laurels, CACI International has spent the last 5 years developing a new enhanced technology that delivers simultaneous dual action facial toning and skin rejuvenation.This new technology known by the acronym S.P.E.D® (Simultaneous Photo Electrical Delivery) combines the original CACI facial toning technology with high brilliance pulsed LED light stimulation. At the end of 2017 a third party clinical study was conducted by Cutest Systems ltd comparing the results of standard microcurrent with the new enhanced S.P.E.D ® dual action technology. The study found that not only did the new S.P.E.D® technology deliver better results than standard microcurrent, but also the results were achieved within a quicker time frame and lasted for a longer period. Similarly the study showed that 2 weeks post completion of all treatments, results targeting acne blemishes using the SPED enhanced technology had gone from up to 49% improvement to up to 53% improvement whereas the standard microcurrent results had been maintained at up to 43%. A reduction in wrinkle depth of up to 70% was achieved after 5 x 1 hour treatments using SPED technology whereas the standard microcurrent took 10 x 1 hour treatments to achieve a comparable result (up to 69% reduction in wrinkle depth). 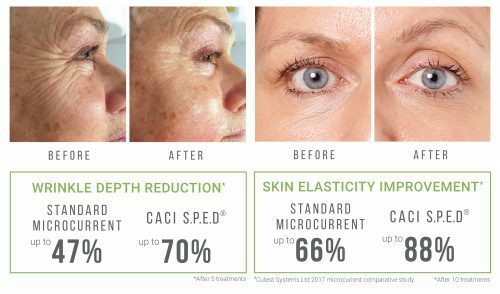 In conclusion, whilst the standard microcurrent technology still achieved impressive results, the CACI’s new SPED enhanced technology was proven by the study to deliver Quicker, Better and Longer lasting results. CACI non-invasive treatments can be found in over 6,000 UK aesthetic clinics and spas and in 97 countries around the globe. 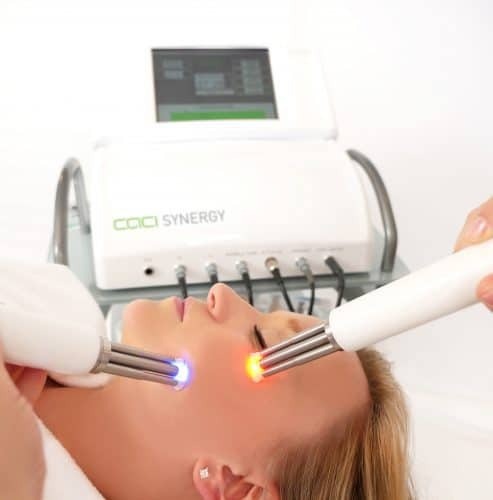 CACI treatments truly do deliver visible and instantaneous results without the need for surgery or invasive procedure and leaves skin looking rejuvenated and lifted.